Momofuku Week ends with this recipe for Roasted Rice Cakes, but I’m pretty sure I’ll be posting more recipes from the book very soon. I had little interest in Korean food until a few years ago. My experience had been limited to the plethora of grilled meats that most people associate with Korean cuisine, and other standards like bibimbap, soondubu, and even banchan were never on my radar. It wasn’t until I ordered the roasted rice cakes at Momofuku Noodle Bar in 2007 that I started get more interested in non-barbecued Korean dishes. I remember ordering the roasted rice cakes as an appetizer without having any idea what it was. When they arrived at the table, I marveled at the bright red sauce that coated the crunchy-yet-chewy rice cakes. My friend Soo Jin told me that this dish was called dok boki (dok means rice cake), and it soon became a regular order when I was at Korean restaurants. Momofuku’s roasted rice cakes deviate from traditional dok boki by pan roasting the rice cakes instead of boiling them so that they’re crispy on the outside but still chewy on the inside. According to David Chang, pan roasting is something he only saw in Japan, and to me, the texture contrasts make the dish a lot more delectable. Like hot dog carts in New York, dok boki vendors are ubiquitous in Seoul, and this recipe is Chang’s interpretation of classic Korean street food. 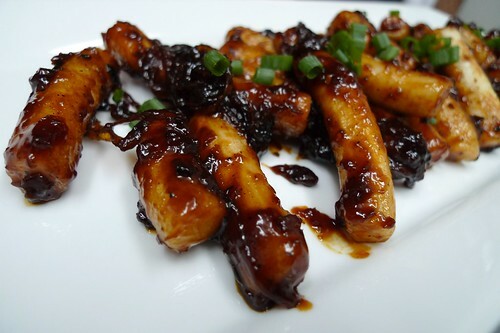 It features pan-roasted rice cakes tossed in Korean Red Dragon Sauce (recipe below) and garnished with green onions and sesame seeds. The Red Dragon sauce includes roasted onions, which I overcooked slightly but still added a nice smoky flavor. I was able to pick up fresh rice cakes and other ingredients from a great little Korean market near my house. Note: The recipe calls for ramen broth, but I didn’t have any on hand so I substituted it with bacon dashi. They’re two totally different things, but the end result was still really good. Combine mirin and bacon dashi in a saucepan big enough to hold the rice cakes later. Boil to reduce until lightly thickened, 2 to 3 minutes. Add the Korean Red Dragon Sauce, turn the heat down to medium and reduce the sauce to a glossy consistency, 6 to 7 minutes. Stir in the roasted onions. Cover and keep warm until rice cakes are ready. While the sauce is reducing, heat a very clean cast-iron skillet over medium heat until hot. Add the oil to the pan and when it just starts to smoke, add the rice cakes. Sear the rice cakes for about 3 minutes per side until they’re light golden brown. Bring the sauce back up to a a boil and toss the rice cakes in for a few seconds until they’re evenly coated. Add sesame seeds and toss again. Transfer to a serving platter and garnish with green onions. Bring water and sugar to a boil in a small saucepan, stirring until sugar dissolves. Remove from the heat and let cool for a few minutes, then stir in the ssamjang to dissolve it. Stir in the soy sauce, vinegar, and sesame oil. Taste the sauce; no one flavor should stand out, but all should be present and accounted for. Adjust as necessary. This post brings back memories… I still remember eating these on the streets and scooping up the last bits of sauce with soondae (blood sausage) or pig lungs. Looks tasty, great job! Thanks, Sean. I actually really like soondae even though the texture freaks me out a bit. :) Never head pig lungs, though. Dok boki is one of those things that my mom never made (she’s Korean), but I fell in love with it the first time I tried it when I was seven. From that point on I was on the lookout for it every time we went to one of her friend’s houses for dinner. I still haven’t tried making it at home, but the pan-roasting has piqued my interest. I may have to make a run to the Korean market later. OK, I see those rice cakes and always wonder how to prepare them…. 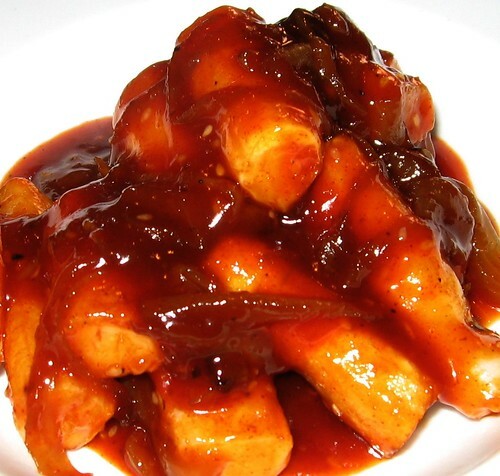 Oooooh….I love Korean tokbokki. Never miss that when I go to Korean restaurant. I love the chewy texture and the spicy sauce that goes with it. Yours look very delicious here. Thanks for sharing. I clicked through thinking these might be like Japanese grilled rice cakes that my stepmother used to make but these look great too…I live in Austria at the moment though and might not be able to get the Red Dragon brand of sauce – what’s the generic name?